Centered around a broadcast spot entitled “Up Before the Sun,” the campaign is derived from insights the brand found in a recent survey, namely that many travelers find it hard to maintain exercise and other routines while traveling. In the anthem ad, a voiceover delivers the line “Contrary to ancient wisdom, the sun doesn’t rise, we do” over a dawn scene in the city. It concludes with a woman hitting her alarm at 6:00, only she’s not just waking up. Two shorter spots deal more directly with wellness themes and how Westin can help its visitors exercise and eat well. Namely, they promote the chain’s gear lending program and SuperFoodsRx menus. 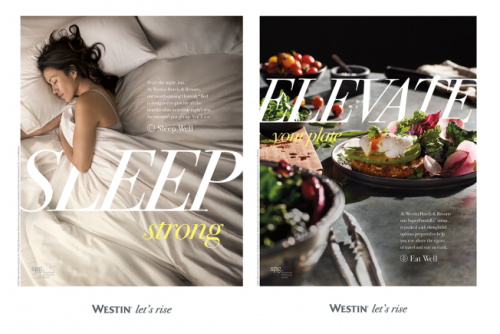 Supporting print ads also promote Westin’s wellness campaigns. 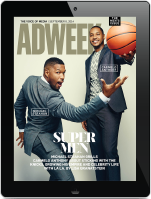 It’s a well-timed message for the start of the year, when travelers’ New Year’s resolutions are still top of mind, but it also speaks to how the brand seeks to differentiate itself from competitors new and old. And it’s a stark departure from the type of humor we saw on display in BBH New York’s collaboration with McSweeney’s for the brand in the fall of 2015.